The two digital recorders in my arsenal get used together when I am doing an EVP session. Using two recorders together will give me a better chance to understand what I am hearing and if the sound or voices are a natural to the environment or even possibly myself or a teammate making a sound that did not get tagged. 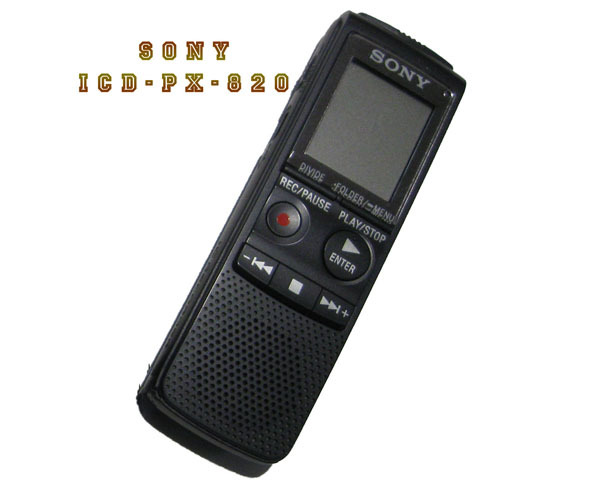 The Sony ICD PX-820 is an inexpensive recorder that I picked up for about $30. I really like this recorder for its simplicity to use and the ease of uploading to a computer for review. This recorder has a decent frequency range in SHQ mode (super high quality) of 75 Hz – to 20k Hz. On this setting you will be able to record for about 22hrs and 15 min. then you will need to plug in the usb cable and transfer your MP3 file to your computer. If you could only have one recorder this would be the one. It’s practical, cheap, easy to use and very reliable.